As one of the world’s leading providers in IT solutions, Red Hat's Boston office is a fittingly sleek and industrial space, infused with thoughtful design elements that reflect the company's unique brand and culture. Within their seemingly straight-forward office layout, tucked behind a secret door, you'll find a small speakeasy space that the team uses for social occasions and company events. 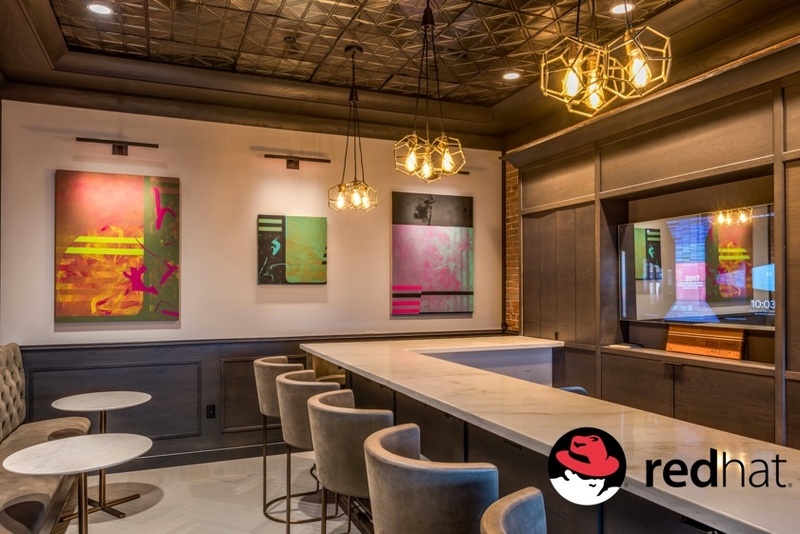 To make the design of this lively space match it's function, Red Hat turned to TurningArt to install a rotating collection of original paintings that features the work of local student TurningArtists. “Our company operates at the intersection of technology and humanity, and we want our art to reflect just that. Fortunately, through working with TurningArt we've been able to realize our vision of having a beautifully curated space which simultaneously reflects our company values and supports local artists.